Being a leader can be difficult...everyone looks to you for the answer before you may know there is a problem, people look to you for the answer when there is a problem, people get frustrated with you when you can't solve the problem. Almost everyone has been in some sort of leadership position during their lives. If you come by leadership naturally, the frustration of things not working out as you may have planned can be especially frustrating. There are many important qualities of a leader...vivacious personality, a go-get'm attitude, energy, respectful, but most of all, as a leader, you must have the pulse of those around. If you are not aware of what is happening with those around you, it can be difficult to move forward. When leading a group of people, there will be times where you have to leave others in charge. You need to be able to trust that they have the same vision and will support it in their work. If not, then destruction can happen in your absence. Words from those who are moving away can often be more vicious than actions and those that are misguiding can be deadly when said from a position of power. As a leader, it is important to surround yourself with those you can trust. As human beings, we try to put our best face forward so that a positive impression is made to those who lead us. Sometimes this face is put on out of fear, other times out of true support. As a leader, it is important to know the difference. Having someone work with you our of fear will never result in true collaborative work, but rather work that is minimized with anger and frustration. Collaboration comes with shared vision and open and honest conversation. This type of leadership moves an organization forward. True leaders seek constructive criticism and feedback, while building relationships of trust and honor. They honor others who do good work and point this out so that work supporting the goal is recognized. 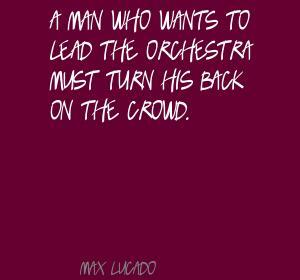 When building up an organization as a leader, there has to be a time where you will "turn your back on the crowd" and be confident that complete mayhem isn't going to occur behind you. The confidence that others will draw together and continue to move forward is often taken for granted. The groundwork for this common goal and vision must be laid carefully so that even when you are not there the good work is still occurring. Sharing and supporting the common vision, being vulnerable as well as being strong is important. Being approachable and not only listening, but hearing what is happening around you is how you gather those around you. Building the Power of One...one person, one group, one organization. One can move mountains, where one cannot.